Accidents involving Tesla vehicles have often been blamed on the Autopilot lately. 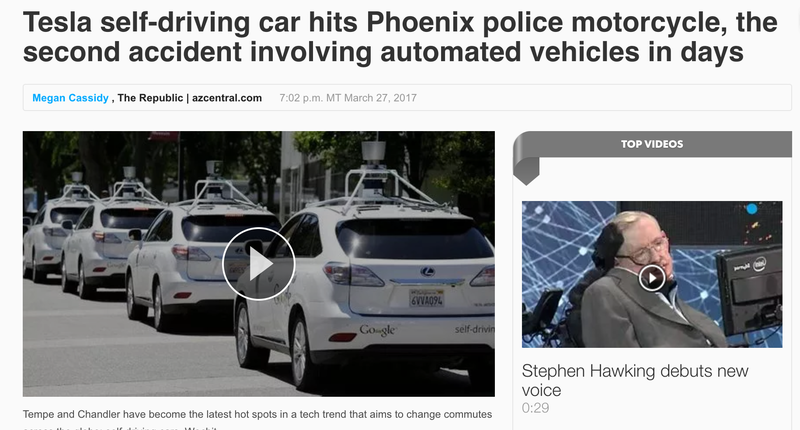 The latest example happened in Phoenix last week when a Model X hit a police motorcycle. Fortunately, no one was hurt. The police said that the driver blamed the Autopilot. “Phoenix police on Monday confirmed that the incident occurred when a Tesla driver and an on-duty officer exited the Black Canyon Freeway onto Utopia Road on the afternoon of March 21. The accident happened a few days before the crash involving Uber’s self-driving prototype vehicle, but strangely, it was only reported yesterday. Of course, Tesla’s Model X is not a “self-driving car” – nor was it even confirmed that the Autopilot was engaged. Tesla said that they didn’t receive any complaint about the incident and therefore can’t even pinpoint the car or time to pull the logs and see what happened. Since the police nor the Model X driver seem too concerned with the incident, it doesn’t sound like it will be pursued further and that we will know exactly what happened. Though it’s clear that it wouldn’t be wise to compare an accident with Uber’s self-driving test fleet program and an accident with a Tesla vehicle owned by a customer using driver assist features.